You can buy and sell horses in almost any town in Red Dead Redemption 2, as well as finding some wild beauties on your travels. 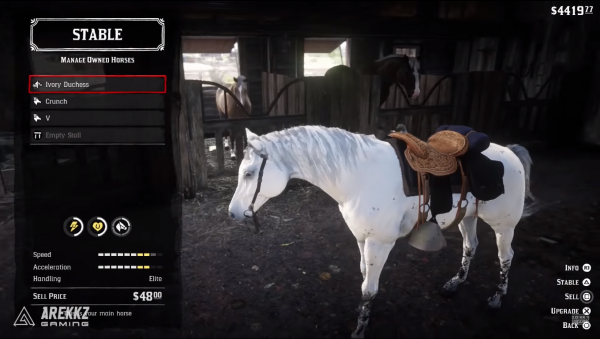 There’s a special white-maned Arabian horse you can find that is arguably one of the best horses in the game. It’s the fastest wild horse that you can get too, so a good one for a thrifty cowboy. 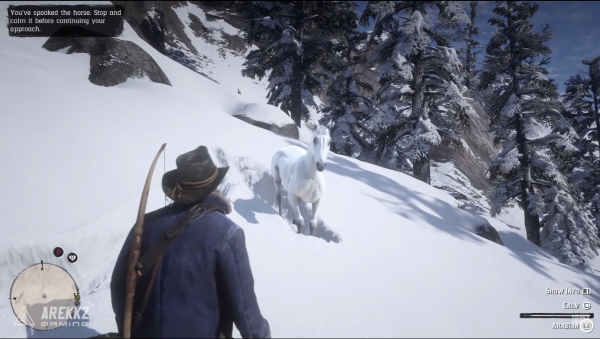 The horse is hidden away in the Northwest of the map and because there’s a lot of snow on the ground, it can be easy to miss. You can go and find this horse as soon as you’re able to free roam around the map and it’s worth doing early on. Start by heading up to Lake Isabella . As the horse is a wild animal it will run around the lake and not stand still for long, so just bear that in mind. Also, keep your eye out for wolves and the like, because the last thing you need here is to end up as dog food. This horse is quite difficult to tame, so you may need to follow it for a while to try and calm it down enough for you to approach it. Once you find the horse, hold down LT/L2 and approach the horse very slowly. There is a bar in the bottom right corner you need to watch. If the bar begins to deplete, quickly tap X/square to calm the horse down. If the horse begins to get agitated you’ll need to slow down or simply stop moving to let it calm down again before you can continue. Once you’re close enough you’ll be able to pat your new friend and then mount it. It’s also worthwhile studying the horse once you’re close enough and the horse is calm enough. Once you’ve mounted the horse, you’ll need to try and break it in. Hold in the Left analogue stick and move it in the opposite direction of the horse’s movement to stay balanced. So if the horse moves forward, hold back, if it moves left, hold right, etc. Keep fighting it like this and you’ll get a notification once you’ve successfully broken it in. You can now take it over to your previous horse to swap your saddle over to it. The horse is now yours forever and should continue to bond with it to improve its obedience and performance. This white Arabian has a health and stamina rating of five, and speed and acceleration ratings of six. It also has Elite handling. The Arabian breed seems to be the best of all horses in Red Dead Redemption and there are two others you can buy, one of which is black and the other rose, through story progression. They have slightly better health and stamina compared to the white horse, but it’s the only one you can find in the wild. You can find out where to get the War horse in Red Dead Redemption 2 in our guide here. Now that you’ve got yourself a beautiful new horse, you’ll need to take care of it properly, so here’s our horse care guide, including how to brush your horse. You can find out how to change horses in our guide here. If you need more help with Red Dead Redemption 2 – and we wouldn’t blame you, it’s massive – check out more of our detailed RDR2 guide. It’s got everything from treasure hunt locations and side quest guides to cheats and fast travel tips. Red Dead online is now available for most players, so here’s Red Dead Online beta guide, with tips and tricks to get you started in the single-player story missions and multiplayer modes, how to unlock all the weapons, Ability cards and more.